Happy Saturday! It has been a while since I showed one of my cakes. If you are new and haven't seen the others, feel free to check them out by clicking on the "cakes" link on the right side of my page. Ahhh, Just looking at this one brings back horrible memories. I bit off a little more than I could chew when I decided to make this. I started my cake classes in February of 2009 and I made this one in May of 2009. I had high hopes for it, but it was a nightmare to make. I don't think I was ready for a 3 tiered cake at that time in my cake "career". I wasn't at the point in cake classes where you learn how to make tiered cakes. I made quite a few mistakes with this one and it pretty much fell apart by the time the party started. The only part I was happy with was the fondant candy. All of the lollipops and gumdrops were really fun to make. After I was done making them, I brushed a little water over them to make them sticky and put sugar on top. My first mistake as far as the construction goes, was the types of cakes I made. They were way too moist, so they couldn't hold all of the weight of the tier on top. I made lemon, strawberry, and chocolate chip cookie dough flavored cakes. The strawberry one had real strawberries so it was very moist. It tasted good, but it wasn't ideal for stacking other cakes on top. I had such a hard time constructing this. I hadn't learned how to stack yet and this was my first try. I iced the cakes and then tried stacking them, which ruined both the cake I was stacking and the cake below it....that's why I had to put those thick ropes between the layers, to hide the horrible gaps. Argh, I was actually in tears while I was making this. I get stressed enough when I have a bunch of people coming over that I have to entertain; and then to have to decorate a cake that was way out of my league??? That threw me over the edge. 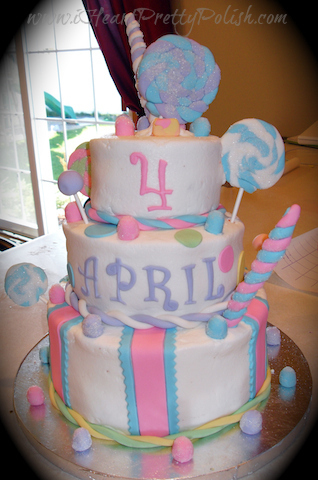 I stored the cake overnight and when I went to get it the next day, half of the fondant lollipops had fallen out and the cake was tilting and almost tipping over. That was mistake #253....I should have refrigerated it. I have since learned that sticking the cake in the fridge makes it harden a bit and keep its shape. In the end, no one really noticed the mistakes and everyone liked the flavors. It was just a bad experience for me. I would kindof like to try this one again because the idea of it is really cute. Now that I have a few more cakes under my belt, perhaps it would be a better experience. It looks absolutely beautiful, such as it is. And the strawberry cake sounds delicious. But omgosh, what an experience! D: I would have cried, too, and possibly pitched a fit. There's such technique that goes into this type of thing... I've known it's an art, but I had no idea stuff like the density if the cake mattered. Thinking about it, though, of course it does. I think I pitched a fit too. My husband was a little scared I think. I almost ditched it and thought about getting a Dairy Queen cake! It looks wonderful. And yes, but chocolate? My bd is April 8, can I order one.